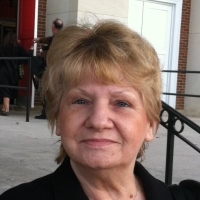 On August 18, 2018, Janice Lee Metcalf, went to her heavenly home. She is the beloved mother of Catherine Wisner and her husband Bruce, Carole Testa and her husband John, Barbara Hamil and her husband Hal, Donald Santmyer, Jr. and his fiancée Susan Flaherty and the late John (Johnny Boy) Tucker, she is also survived by 3 sisters Shirley Robinson, Beverly Boothe and Margie Santos, and by numerous grandchildren, great-grandchildren, and great-great-grandchildren. Ms. Metcalf rests at the family operated HUBBARD FUNERAL HOME, INC., 4107 Wilkens Avenue, Baltimore, Maryland 21229. The family will receive guests on Thursday, August 30, 2018, from 5-6:30 PM with Funeral Services to follow at 6:30 PM. Interment private.